Namibian Dolphin Project: On tourism..
Tourism in the winter months at Walvis Bay is at a high making July and August the busiest months for the companies. Most boats are filled with people who either prepay for the trip, or have reservations for the trip. 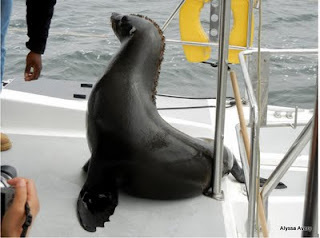 However, every so often one of the interns gets to join the boat on its tour of Walvis Bay to see the marine life. While this may just sound like a fun day off, it is actually work even though they give you “Namibian Coffee” which is actually sherry, but they don’t tell you that. Being on the tour boat is different from being on Nanuuq, or being in the office grading photos, looking at acoustic recordings or evaluating the forms of data collected. Our job while on the boat is to see how many animals either boards the boat (yes it does happen, especially with the seals who like to board the boats for fish) or how many animals interact around the boat. We also make note of how many fish are fed to the local seals, seagulls, and pelicans that are encountered throughout the three-hour boat ride and the seagulls really do sound like the ones from Finding Nemo. We do this to see how tourism is affecting the marine life, and if there should be something done to give the animals a ‘safe zone’ where boats could not go, or give the animals more distance. That way it would be the animals’ choice to interact with the numerous catamarans, ski boats and kayaks that encircle the area on a daily basis. Next month i would also like to visit Walvis Bay. The Namibian Dolphin Project is quite a spectacular one for its travel and tourism industry. Such projects will surely be quite helpful in attracting more and more cheap flights to Windhoek each year. Namibia is day by day improving as a wonderful African holiday destination. this is very great show and my child love to watch this and we have great trip with our family when we go for watching this project thanks for sharing.